As fresh fig season comes to an end, I hope you’ll take advantage of it and try these simple bites. They are great for an appetizer if you’re entertaining. This would be a great substitute for a cheese plate. If you’re using this as an appetizer, I suggest 2 to 3 per person. I think that any soft cow’s milk cheese would work here, depending on your preference. I’m not exactly sure what cheese we had – it was something on special at that store that day. With all of the figs and heirloom tomatoes in our house, we made a dinner of these bites and caprese salad. It was great for a warm fall evening. If you choose to make this part of a meal. you’ll want to have quite a few; I recommend 5 to 6 per person. Wash the figs and pat dry. Trim the stem from the top. Then, as if you’re cutting it in half, cut toward the bottom of the fig but don’t go all the way through. Repeat 90 degrees from that cut, making an X. 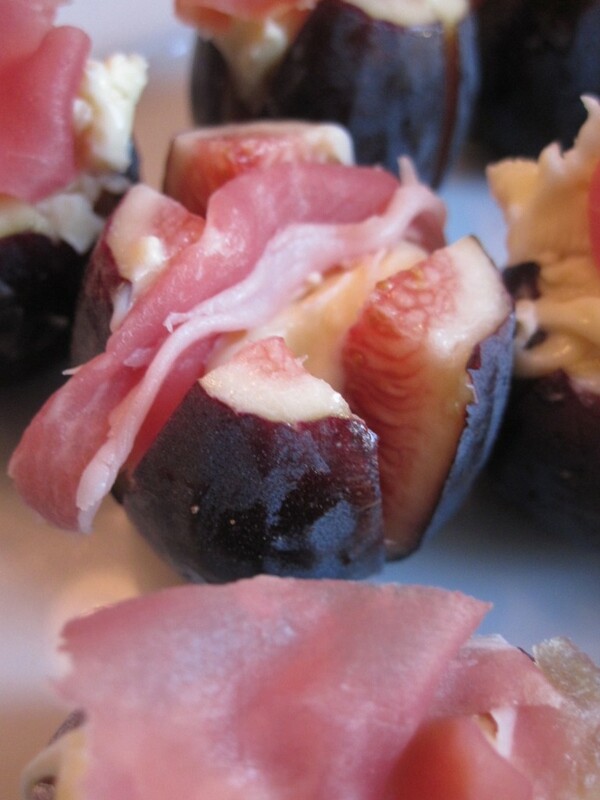 Using a spoon, place a generous dollop of the soft cheese in the center of the fig. This is why it’s helpful to have room temperature cheese. Top the cheese with about 1/4 of a piece of prosciutto. Serve and enjoy!